Lyndsay and Seth Stretch live in the fourth or fifth oldest house in Windham, built in 1767. They are caretaking it now, is how they see it, but in the mean time they have built a thriving business beautifying the lakes region. They never wanted to be the lawn care company next door. They have a saying, “we’re the one to call when your yard needs it all, winter, spring, summer, fall,” said Seth. They do earth work, fix driveways and add patios during the warmer months, as well as plant flower gardens, vegetable gardens and trees, and do seasonal clean ups. They also do lawn care, but really do so much more. In the winter they take care of all your snow removal needs. In 2015, the Stretch’s fell into the business when they bought Storey’s and their client list. “That gave us our start,” Seth said. Before Stretchway, Seth was a full-time mechanic. Lyndsay spent six years as a professional landscaper, which she has been able to continue through the company. “When you’re in business for yourself, you come home to see nobody weeded my garden,” she laughed. Lyndsay also went to school to become a chef, which she still enjoys. “It’s a lot of hard work. We are our own bookkeepers, project manager and deliver mulch and soil,” she said. Lyndsay enjoys the gardening aspect of the company, whereas Seth likes building things and making something out of nothing. Lyndsay has been trained in shoreline zoning and continues her education when she can to better serve her clients. Stretchway is a specialized company and will deliver anything that they can fit in the back of a truck. Seth will travel in search of exactly what a customer wants from color, shade, size and more. There is also education that happens when a client calls. Asking for rocks will prompt the question of what are you doing with them? Because making a stone wall and filling in a driveway use very different types of rocks. In the garden division, Stretchway sells supersoil, a mixture of compost and screened loam that contains no chemicals or pesticides. The Stretch’s admit they might not be the cheapest, however, customers have discovered that they get exactly what they pay for. One woman had a load of supersoil delivered and when she grew her tomatoes, she was amazed at the size of the crop and the fruit. They have a Kubota tractor which is used for grading, patios, rock walls and filling in areas and driveways that have been washed out. Whether it’s brush hogging, cutting and digging drainage or something else a homeowner needs, check with Stretchway first to get the job done right. “Our customers really appreciate us,” Seth said. They get thank you cards from some of them and 90 percent know them by name. “This has opened our eyes to the members of the community,” Seth added. When it comes to lawns, Stretchway does dethatching, aerating, fertilizing and soil conditioning. They try to stay in the natural realm, not using harsh chemicals and phosphates. They always have an open conversation with their customers so they get the satisfaction and outcome they were hoping for, Lyndsay said. Stretchway also adds a personal touch to every job and everything they do. When working on free quotes for jobs, they go above and beyond and consider communication to be key. The communication with their customers to make sure they know exactly what is wanted is important regardless of how many emails or phone calls it takes. “We have to collaborate. We take the good with the bad,” Lyndsay said. Lucy Ayn, 5; Preston, 9), takes great pride in the work they do enhancing landowners properties. “I have the best job ever. Rain, sleet, snow, I’m outside every day,” said Seth. The company is managing its growth and has brought on three employees this season. “We’re keeping small this year,” he said. Stretchway works primarily in Windham, Raymond, Cumberland, Falmouth, Portland, Gorham, Westbrook and Gray. They have a variable delivery rate that is very competitive, but they encourage customers to shop around to see that they have the best prices most times. Stretchway can be found on Facebook and the Stretchway website is coming soon at www.stretchway.net. For more information or an estimate email stretchway@gmail.com or call 207-892-8000. Located just before the bridge in Naples, Merced’s on Brandy Pond has one of the best views in the lakes region with vistas of both Brandy Pond and Long Lake. The panorama is only outdone by the food served at this unique restaurant, which serves an eclectic selection of Maine favorites with fresh twists that make them stand out as Merced’s. Owner Frank Merced insists that the food in either of his restaurants, Merced’s or Franco’s Bistro, be made and prepared fresh from scratch. With recipes that he creates himself, Frank conjures up dishes that will make one’s mouth water. Dinners like herb and bleu cheese encrusted tournedos, chicken macadamia and wild mushroom ravioli make Merced’s exceptional with its special homemade sauces and pastas. He serves high end steaks and filets. One of the most popular dishes is the Maine shellfish estiva, which is sautéed lobster meat, shrimp and scallops tossed with mushrooms, red peppers and snap peas, in a lobster sauce over fresh pasta and sprinkled with pecorino Romano. “That’s my concept. Offer fresh. I’m basically doubling down. I don’t compromise that,” he said referring to Franco’s Bistro in Windham and Merced’s in Naples. Dinner guests must leave room for the homemade desserts. They can choose from crème Brule, chocolate amaretto cake, lemon cheesecake with blueberry sauce or an ice cream puff with homemade chocolate sauce. This weekend, Frank is ready for the Maine Blues Festival and Father’s Day, preparing 200 Ciabatta rolls and special dishes to share with the music lovers. There will be lighter fare on Saturday. “It’s not the day to relax and have a nice dinner, he said. “The music is nice and loud.” There will be six bands playing the Merceds’ parking lot with a solo artist in the evening playing soft blues. The festival is a “collective effort, with good exposure. The town offers something unique and it’s only Maine bands,” Frank said. With 20 to 30 employees in the summer, Merced’s is hopping with its two floors of seating and two outside decks. After 5 p.m. boaters can tie up the main dock and walk the few hundred feet to Merced’s. And if they don’t want to eat in, Merced’s offers its entire menu to go. The fun, casual restaurant can seat 135 inside and out and can host private parties for up to 60 people. There is a full bar with Maine and New England brews on tap. They also have an extensive wine list. “They get to leave here happy,” Frank said of his customers. He knows the customers who frequent the area because he has been a chef in the lakes region for 30 years. There are plenty of restaurants, but Frank knows his concept keeps the guest coming back. “We all offer our different things, but not like this,” he said. homemade lemon and thyme vinaigrette. The summer menu is not yet planned, and although Frank will keep the fan favorite items like the ravioli and the baked stuffed shrimp, he is marinating on new recipes to delight and keep his guests and their taste buds on their toes. As the chef and owner, Frank makes sure to speak to most of his customers while they’re eating. By checking in, he is able to create the rapport with them that makes them feel special. “One of our successes is that I’m able to do that,” he said. When Frank can’t be at one of the restaurants his wife Elaine, who runs Merced’s, takes care of the customers. Merced’s sous chef is Alan Mitch, who has been working in a kitchen for 15 years. Merced’s on Brandy Pond is open for dinner from 4 p.m. to 9 p.m. every night. They close at 8 p.m. on Sundays. In July they will begin opening for lunches on weekends. For more, find them on facebook, visit www.Merced’sonbrandypond.com or call ahead for reservations at 207-693-5332. A green, manicured lawn brings pride to a homeowner and envy to neighbors, but is not always that easy to achieve. But that reality is only a phone call away with East Coast Lawn Care, the newest lawn care business in the Sebago region. 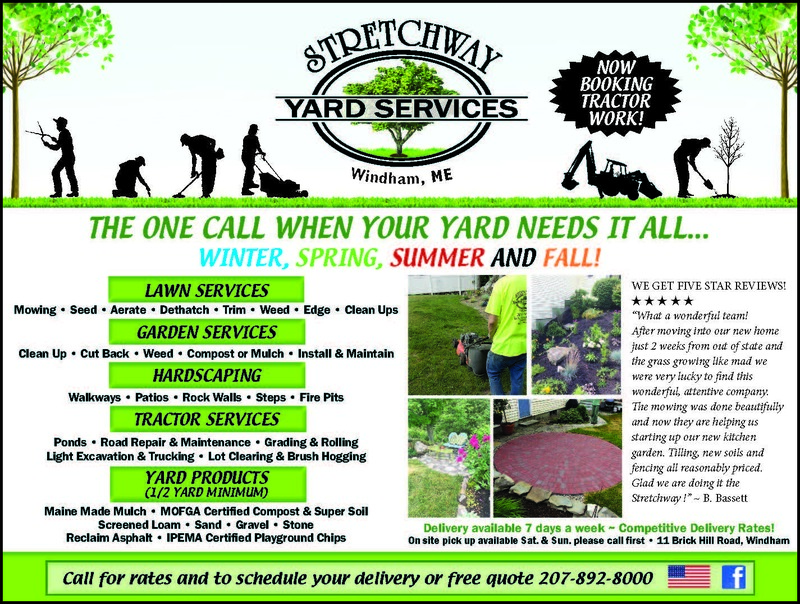 Based in Windham and owned by Tomi and John Pastore, they are ready to get to work on your lawn. “We focus on lawn care, mulching, mowing, aerating, edging, fertilizing, clean ups and sod installations,” Tomi said. John is a certified Audi and VW mechanic by trade, who is known for being reliable and having a great reputation. Branching out into lawn care seemed like a good plan to spend some time outside and in gardens. Tomi works with John and takes care of their three children, all of whom are under 8 years old. She enjoys vegetable gardening, so planting flowers is part of the services East Coast Lawn Care provides. Being cautious of their growth, the company will serve the greater Portland area. “People are so busy, there’s no time to mow their own lawn. We understand people have lives and want to spend time with their families,” Tomi said. East Coast Lawn Care will take care of the yard work, so families can enjoy the summer. East Coast Lawn Care is qualified, convenient, responsible and fully insured. They prefer to set prices based on the job after inspecting it. They do free estimates. “We want to be an honest, timely, professional, word of mouth business. We’re reliable. If we say we’ll be there every other Monday, we’ll be there,” Tomi said. They believe in customer satisfaction and are a family business that wants to help other families keep their yard in pristine shape. “John has always taken pride in his own lawn. Now he wants to help people accomplish a beautiful lawn for themselves,” Tomi said. East Coast Lawn Care also takes care of spring and fall clean ups. They can help fix up a summer home on the lake before the family arrives or can plant annual flowers to give the property a pop of color. Raking, mowing or fertilizing, they can have it done now. John has the know-how to get your dull lawn to turn green and lush. For example, he knows when to fertilize and with what types of products to suit your soil and conditions. Now is a prime time to fertilize because the lawn is reviving after a long season of cold weather and dormancy. Come spring, lawns need to be fed to turn green and grow. Soil supplies some of the nutrients grass needs, but many soils lack elements that lawns need to survive the growing season. Trying to sell properties in the area, but don’t want to have to be mowing the lawn before showings? Let East Coast Lawn Care set up a regular schedule to do the maintenance until the home sells. Regardless of what type of lawn care work you need call East Coast Lawn Care so the best yard in the neighborhood will belong to your family. 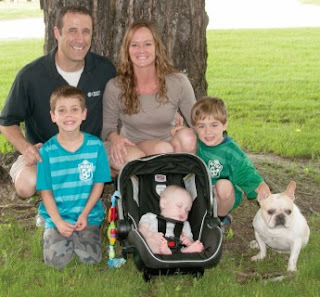 John has lived in Windham for 15 years and their children attend Windham schools. Tomi has been a Windham resident for five years. As a Navy veteran, John plans to give discounts to honor Veterans and seniors. Both John and Tomi are involved in Windham youth soccer as coaches and volunteer when they can with other organizations. 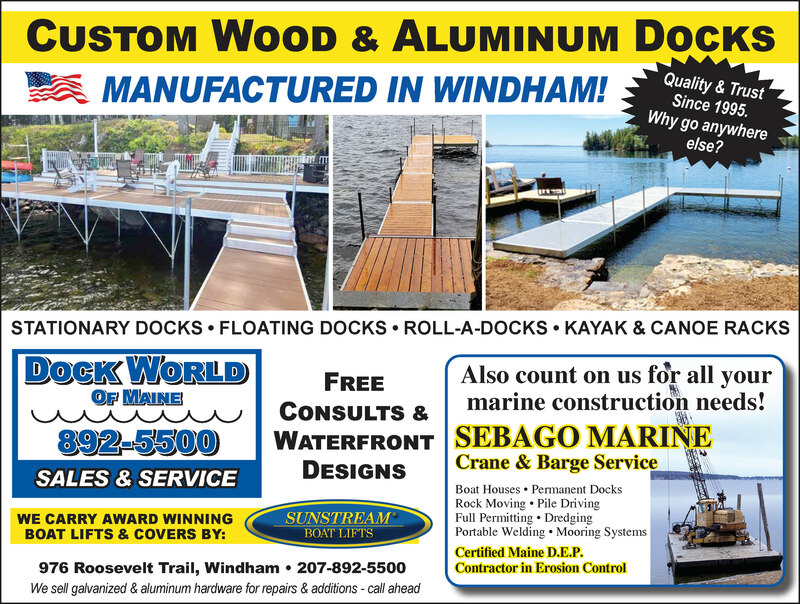 When it comes to dock sales, service and waterfront construction, Dock World of Maine and Sebago Marine are a full service operation based in Windham. Under the direction of owner Del Wescott, Dock World has been in business for 22 years. “These hands have touched every type of dock out there,” said Wescott. “You get it all with us.” The company sells new docks from floating and stationary docks to wooden and aluminum docks. They also offer SCUBA services for underwater work and retrievals, should your boat happen to spring a leak and sink. The company is a family business employing Wescott’s sister in the office and his son, who is one of the welders on staff. From dock installation to service after the sale, Dock World is ready for their customers usually within 48 hours. They pride themselves on fast service that is done correctly the first time. Dock World sells and installs Sunstream Boat Lifts. “They are the most expensive. They’re the Cadillac of boat lifts,” Wescott said. They have a remote control and are solar powered. “Our clients have no time for service issues. Summer is so short anyway. They don’t want to be without a dock for two weeks,” he said. Using the best product almost guarantees that boat owners won’t have to miss prime water time. Dock World services 2,000 dock sections per year all around the Sebago Lakes region and some dock work on the ocean. They do their own metal fabrication and welding when a dock needs repairs when a boat runs into the dock or other issues that might come up. The company also manufactures wooden docks to customer specifications. “We’ve built and sold thousands,” he said. Customers looking for dock work can speak with dock supervisor Bobby Clark. “He handles most all of our dock installations and service. He’s been with the company for 10 years,” Wescott said. Wescott prides himself on the company’s great customer service. “When experience and reputation matters, call us. That counts for a lot,” he said. The company has proved that with continual growth every year since 1995. The newest branch of Dock World is Sebago Marine, which has been doing marine construction for over 10 years. The 98,000 pound barge they own travels from Standish to downtown Harrison to repair and build on the shoreline. “We service every marina solely from here to Harrison,” he said. They help with moorings and other building projects. Their skilled laborers create permanent dock systems. They have underwater equipment like drills or chainsaws. Some of the team are SCUBA certified. Sebago Marine also does dredging work for municipalities and for the Sebago Lake State Park, when they need the river dredged. “We work closely with the Maine DEP for grandfathered docks, like permanent crib docks,” Wescott said. They make sure they have permits to do any work on the water. Some of the work is done in the winter when the water level is lowered. “I am a certified erosion control person,” he said. They have saved more than 1000 feet of shoreline over their years in business and plan to save lots more. “We are a full service company. All of my people are employees, not subcontractors. We pay all insurances and benefits for the seven employees,” Wescott said. Dock World has a showroom in North Windham at 976 Roosevelt Trail and will be expanding their retail operations there with cash and carry items and hardware. In the off season, the four year round employees work doing building construction, like barns, garages and kitchens, said Wescott. For more information or to schedule an appointment with Dock World of Maine, call the office at 207-892-5500, email Sebagomarine@live.com or fax 207-892-5527. Their website is under construction at www.dockworldofmaine.com, watch for updates.